When I signed up for the Brew City Half Marathon, I would NEVER had guessed that it would be the same weekend that Mother Nature would throw one of the largest snowstorms in over 100 years at us! I know that living in Wisconsin means that the weather can be (and often is) unpredictable. Many of my friends will not even sign up for races that are being held before May because there is always that chance of snow. 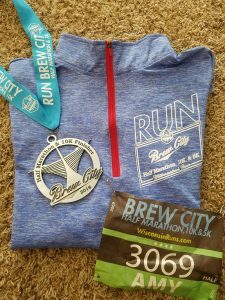 I knew that I was taking a chance on registering for the Brew City Half Marathon in Milwaukee in the middle of April. It could be cold, it could snow, it could be hot, or could be rain… but when you have goals and the race fits into the guidelines of reaching said goal, you take that chance. 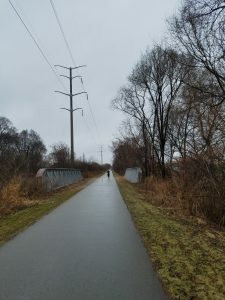 Driving down to Milwaukee on Friday was a mix of rain, sleet, hail and everything in between. I kept thinking to myself about what I packed. Did I have warm enough stuff? Did I pack a rain poncho or jacket? Did I remember my race fuel? 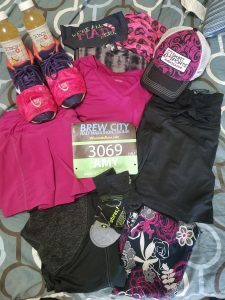 Since I was staying with my friend and fellow Skirt Sports Ambassador Hannah, and she was still at work, I headed downtown to packet pickup as soon as I arrived in town. Packet Pickup was at InStep down in Milwaukee’s historic 3rd ward and thankfully there was a parking ramp right around the corner. As soon as I walked out of the parking ramp, it hit me. Mother Nature that is! The cold wind off the lake was enough to make me want to turn around, get back in my car and keep driving south! Thankfully (at the moment) the rain and stopped. I made a quick stop to pick up my race bib and jacket and then walked down to a few shops in the area to try and pick up a few things before heading back north towards Hannah’s house. 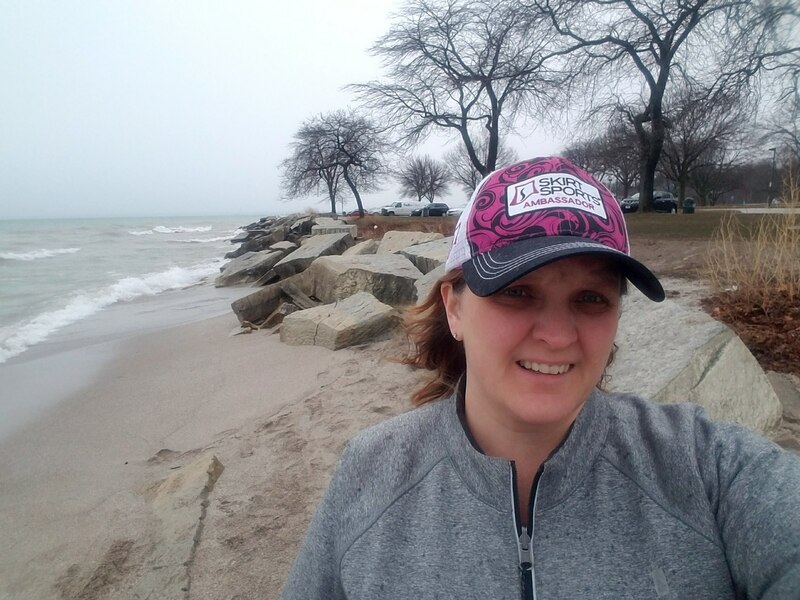 As I was driving north on Lake Shore Drive, I had to stop at the waterfront… who would have thought Mother Nature would throw this at us in the middle of April! That is pretty much the only way to describe this weather! I spent some time on Friday night going through what I packed, trying to decide what I was going to wear for the crazy weather. Layers were going to be key, but which ones was the questions! I laid out everything and decided to sleep on it and make a decision in the morning. I had about a 25 minute drive to the race, so I was out the door early. When I arrived at the park, the parking lot at the start line was full so I started heading towards the lot they had set with shuttles to the start line… but just past the start line, I found another open lot that had a few open spots, so I grabbed one. There will only 5 spots left when pulled in, so I considered myself lucky! Besides, it was already raining and I didn’t want to have to deal with waiting for shuttles after the race – I knew that I was going to want to be as close to my car as possible. Before leaving my car, I stuffed my pockets! In my Long Haul, my bottles were filled (one with water and one with Detch), I had my small bottle of pjuractive (I wasn’t taking ANY chances with chafing today in all this rain! ), a Honey Stingers Waffle, a few gummy bears and chapstick. Pockets in the jacket also contained a rain poncho, plus the back pocket had 2 gels. I grabbed my gloves and headed to the start line. I chatted with a few people. One group I talked to had drove over from the Twin Cities and had to drive through the same snowstorm that I was going to have to head into to get home. The 10k and half marathon started together at just after 8am (5k didn’t start until later). One thing I noticed was that the color of your race bib did NOT indicate which race you were running. They helped to indicate when you were starting, based on your anticipated pace. I had a green bib, which meant that I was starting in the 3rd wave. Right around 8:15am, we were off. The route followed the road through the park for a bit before moving around to the local trail. We headed south for a few miles and just before the 5k mark, we turned and headed back north along the Oak Leaf Trail. The trail is paved and lined with trees, which tried to protect us from the wind and rain, but it only provided limited relief. Thankfully, the rains stayed light but the winds were not as pleasant. By the time I reached the 4 mile marker, I wanted to be done. The winds were miserable. The rain was unrelenting. (but in the grand scheme of things, I actually felt warm!) Shortly after mile 5, I came to the 1ok and half marathon split. There was that part of me that wanted to turn left and just be done with this crap. But I couldn’t. 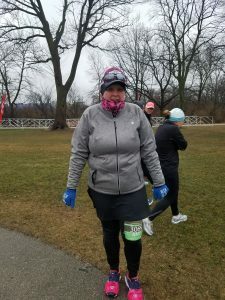 As I mentioned, this race was the first of many to help me accomplish my Half Fanatics Challenge to reach Venus, by running 13 half marathons in 79 days. If I didn’t finish this half, I was going to have to find another one to run between April 28th and the end of July. 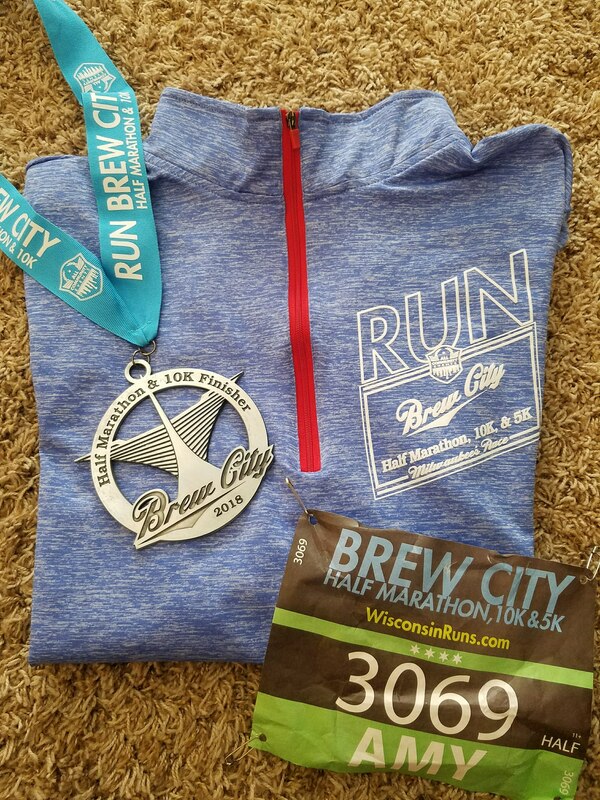 With not many other weekends open, I needed this race! With the current plan, I will finish my 13th half marathon of this challenge in Pennsylvania on July 1st! So, I pushed on past the split and never looked back. As I mentioned, this race was mostly on the trail, so I knew that at some point I was going to start passing half marathoners that were on their way back towards the finish line. I was at about 5.5 miles before the lead runner ran past me. Sounds about right… they were running twice as fast as me. Once I passed the 8 mile marker, there were less and less people heading in opposite direction, so I figured I must be getting close to the turn around. The rest of the race was much of the same. 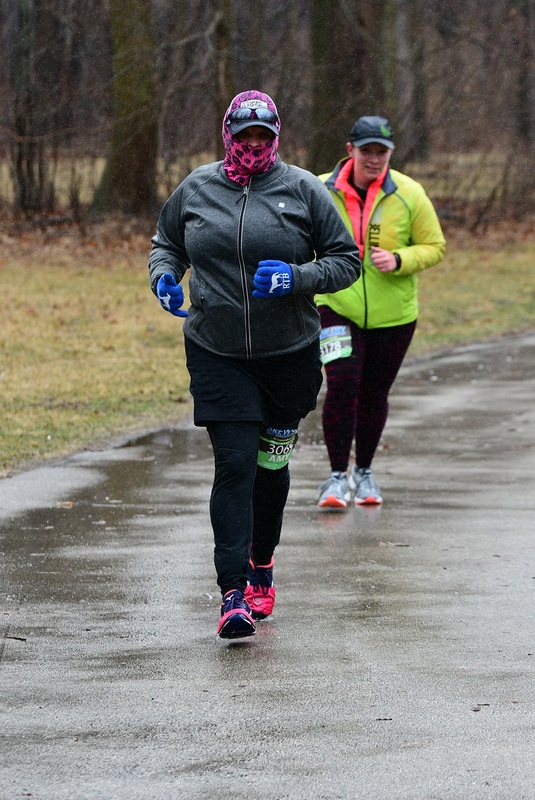 Wind in my face (yes, even after the turn around, I felt like I was running straight into the wind), rain and cold. I spent much of the time pushing through the negative thoughts in my head, working to replace them with the positive. I was strong. I was healthy. I was out here doing what I love, even if Mother Nature was not playing nice. 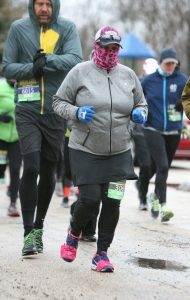 It wasn’t snowing (the were up to 10+ inches of snow at home by the time my race started). 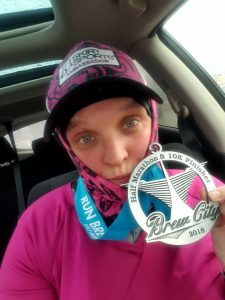 Since the entire course was on a trail, there was virtually no crowd support, except at aid stations and the few random roads that we crossed (grateful for those Public Safety Officials there to stop traffic so I didn’t have to think about that too!). I didn’t let the lack of crowd support bring me down! I created my own motivation. Thinking of those who helped me get to this point. The many amazing women that I run with, the friends that push me to take my training to the next level, my family that puts up with my crazy training and race calendars. By the time I reached the final mile, I found myself running with the 5k runners, who didn’t start until 10:30am. They were the motivation that I needed for that last stretch. So many shouted out motivation to those of us still out running the half marathon. This was what I needed, because right about the time I passed the 12 mile marker, it started raining harder and the wind picked up. It was one of the most miserable miles I have ever run. But I wasn’t giving up. I was almost done. Crossing that finish line, all I could think of was getting my medal, grabbing some food and heading to the car to find warm clothes! As soon as I got to the car, I peeled off my jacket and was excited to see that my middle layer was almost completely dry, even with all the rain! The only spot that was wet was right in the front, where the rain was hitting me when I unzipped part of my packet to cool off a bit since I was too warm. I guess that jacket really lives up to the promise of being wind and water resistant! Plus, my Shoe Hoodies kept my feet warm and dry from all the rain! I guess things could have been worse!! Now to find my way to a hot shower, dry clothes (or at least change out of the wet tights and skirt! ), a bacon cheeseburger and a shot of bourbon! Post-race reflections: On the drive (part way) home from the race, it really hit me what I really just accomplished. I just ran 13.1 miles in freezing temps and rain. I didn’t quit. I kept moving. Sometimes we just need to push the negative thoughts out of our heads and charge forward. You may not be able to control what happens in your life, you can only control how you react to it. I knew going in to the event that it was going to be cold and rainy. Instead of giving up before I started, I made a choice to just go out there and do my best. This was not even close to a PR race for me, but I still was able to finish almost 2 minutes faster than my race in DC a few short weeks ago. This race is the first of many that I have planned on my quest for 13 half marathons in 79 days. Some people may call me crazy, many will never understand why I do many of the things that I do. I am ok with that. I know that I have chosen a hobby and lifestyle that most would never even consider. I do this for me. I do this to challenge myself, to push myself and to prove to myself that I am strong enough. I strive to motivate others to get out and challenge themselves too. Remember, you are worth it and don’t let anyone else tell you otherwise! 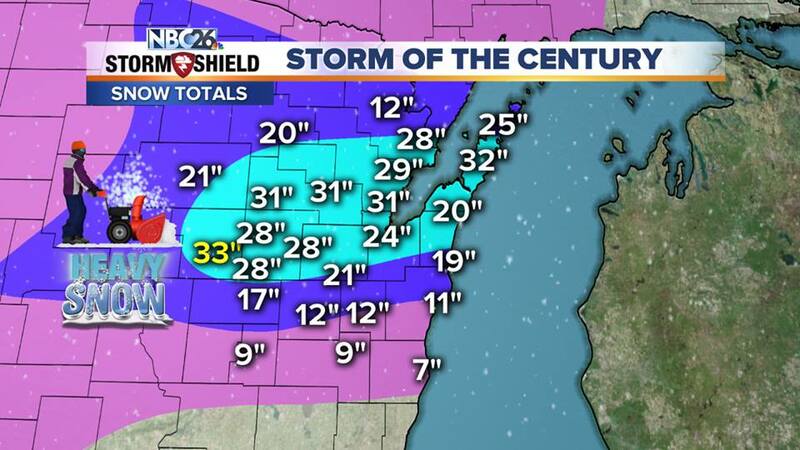 Oh yeah… that snow storm in Green Bay that I mentioned earlier? It was a record breaker! I ended up only making it to just north of Sheboygan, where I spent the rest of the weekend with friends. The majority of roads further north were snow and ice covered and dangerous to drive on. By the time the snow ended later Sunday night/early Monday morning, we had over 23″ of snow in Green Bay and it went down in the record books as the largest snow storm since 1889! I’m grateful for friends that took me in for the weekend, gave me a hot shower, good food and a bed to sleep on. Who would have thought that we would get this much snow in the middle of April? Right now, I want my brown grass and mud puddles back – that is better that the piles of snow in my yard right now! Stay warm my friends, sumer will get here eventually! Until them, keep moving, stay positive and push through those obstacles! Next Stop: Rock n Roll Nashville, April 28th! **I am a brand ambassador for Skirt Sports. I am not paid to mention them in my blog or to wear their merchandise. I loved the brand and the message “Real Women Move” before I was invited to be an Ambassador. You can find out more about her story and the merchandise on www.skirtsports.com. Want to pick up some of my gear from this race, use discount code 699Peno to save 15% on your order! Some links above are affiliate links and I may be paid a small commission for any purchases made via those links. 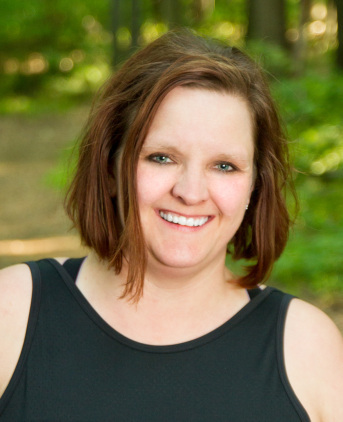 ⟵Is weight loss possible on vacation? yeah, winter has not been fun this year! I was not a big fan of the weather, but you are right, it does feel pretty awesome to finish a race with those kind conditions! Makes you feel like you can accomplish anything!